Lex Gillette A Winning Vision. 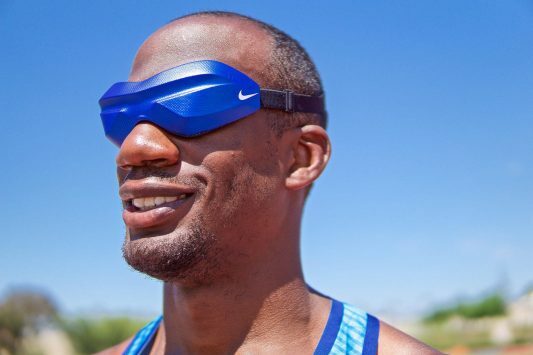 Nike designs custom competition eyewear for Lex Gillette. At the age of eight, Gillette lost his sight due to recurring retina detachment, a reality that shaped his lifelong mantra: “No need for sight when you have a vision.” Driven by the motto and his mother, Verdina Gillette-Simms, who instilled in her son a no-excuses, big-dreams mentality, Gillette embarked on an athletic career. Now 31, Gillette is lauded as the best totally blind American long and triple jumper in the nation’s history. He is the current world-record holder in the long jump, a two-time long jump world champion, 16-time nation champion and two-time gold medalist. And when he takes off down the track towards the pit, he exhibits the key attributes of a superhero, relying on his remaining four senses to guide him — 16 steps and then he leaps. But up until now, that mask Gillette wears has belied his phenomenal feats.